Product prices and availability are accurate as of 2018-12-14 23:56:35 EST and are subject to change. Any price and availability information displayed on http://www.amazon.com/ at the time of purchase will apply to the purchase of this product. 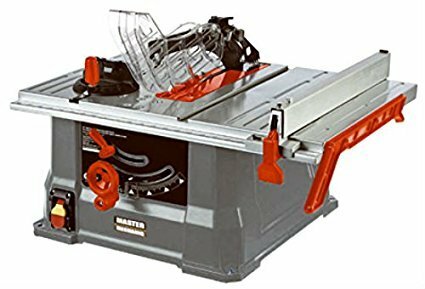 Master Mechanic 10" Table Saw is powered by a 15A, 4700 RPM motor delivering efficient use and optimal results. The 26"x18" die cast steel table top features a 10" blade diameter, 5/8" arbor, 3-1/8" depth of cut at 90 degrees, 2-1/6" depth of cut at 45 degrees with a 0-45 degree blade tilting range. Contains a blade guard system and an easy view measuring system. Includes double sided quick release locking rip fence, 10" 40 tooth saw blade, miter gauge, push stick, 2 blade wrenches.